which controls the assembly of each individual car down to the smallest detail. - note the special containers with component parts easily accessible. 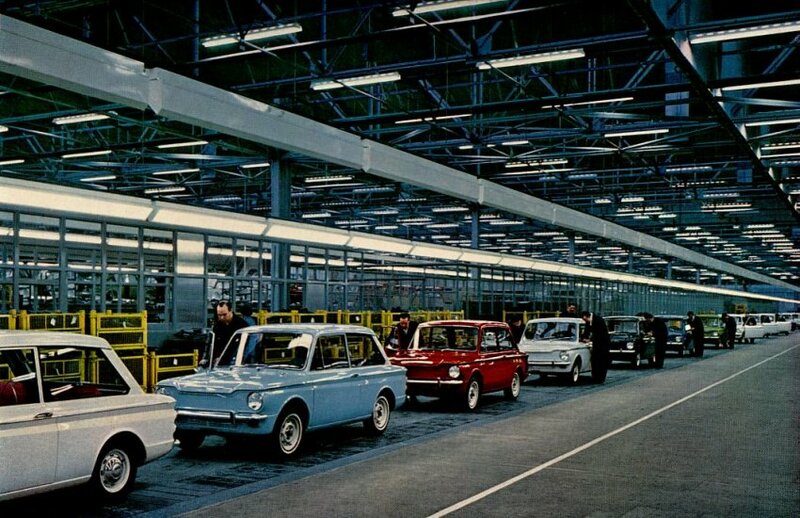 The line of Hillman Imps, now almost complete: with wheels, lights - even water and petrol. The car bodies, entering at about one per minute from the Transporterbridge at the North end, move along a pre-mount conveyor at some 5 ft. above floor level. Operators positioned at 12 'work stations' fit brake pipes, electric wiring and such items as a radiator (made alongside with other parts), to the underside of the car before it reaches the main assembly track. The main assembly of the line has 41 working stations, and the conveyor is arranged to permit operators to work on the car while others work on the underside. Here, working in complete harmony, the network of overhead conveyors functions smoothly, and at a precise moment the body is lowered for the installation of the power pack and suspension assemblies, to be followed by the many components and fitments that go to make up the modern car. Petrol is put in and the cars, complete in every detail, are driven from the end of the track direct to the production roller-test, for checking the range of gears and the lighting equipment. 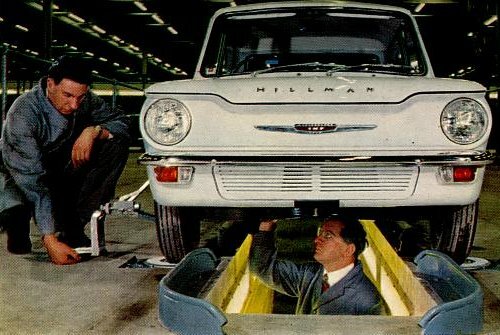 The Car Assembly Block combines all the necessary operation to enable the Hillman Imp to be assembled from the different individual units and sub-assemblies into the finished car: complete, inspected and running satisfactorily, ready to be passed to Sales. Cleaning, polishing and attention to detail on the 'car finished conveyor'. 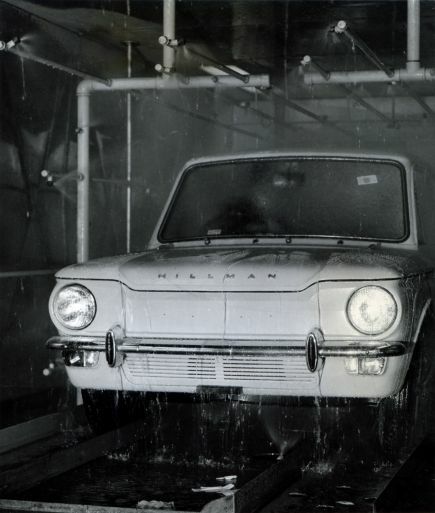 Exacting tests to maintain the highest standards of Hillman quality manufacture. no leaks under adverse weather conditions later on. Next, to the 'car finished conveyor' where vital assembly operations such as steering are checked and passed, and this is followed by cleaning, polishing, and final adjustment. In addiction to the constant supervision and inspection, the skill of craftsmen and the close scrutiny of quality control, there is a further percentage check of production, and also the Car Investigation Department - C.I.D. - where a vehicle is taken at random and is checked in all aspects in order to maintain the highest possible standards of quality car manifacture. In the Car Assembly Block, there is a C.K.D. Section, where all the unit parts, wehicle panels and the multitude of small components required for a complete car assembly, are marshalled in cases, and packed for shipment to Rootes plants overseas. Cars, (Completely Knocked Down), later to be unpacked, built-up as the Hillman Imp, and made ready for a reliable life on the road. 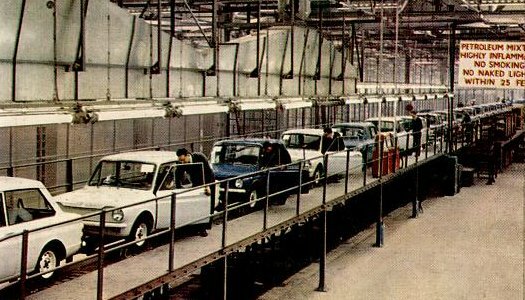 El más reciente modelo de automóvil compacto británico, el Hillman Ímp', es bautizado con objeto de probarlo en condiciones de fuerte Lluvia. Este modelo salió de la línea de ensamblaje de la fábrica de automóviles más modena de Gran Eretaña, situada en Linwood, cerca de Glasgow, Escocia. British official photograph: Crown copyright reserved. Issued for the british information, services by the Central Office of Information, London. 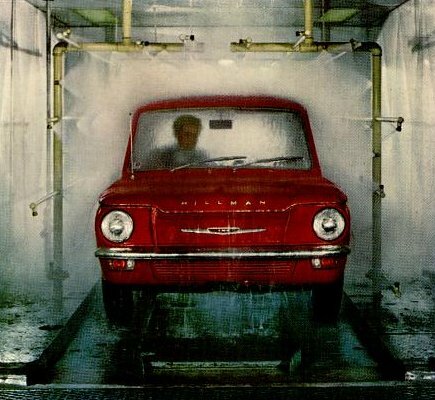 Britain's newest baby car, the Hillman 'Imp' undergoes a baptism - designed to test its weather-proofing at the new factory, entirely devoted to the production of the Imp, which was officially opened by His Royal Highness Prince Philip this May. The plant situated at Linwood, some fourteen miles outside Glasgow, Scotland, has transformed a relatively undeveloped rural area into an industrial community in the short space of two years. 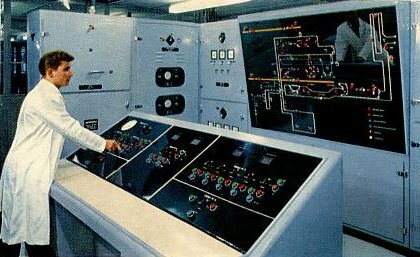 The project has involved the construction of four main production blocks, which cover over one million square feet; the selection and installation of hundreds of the most modern machine in Europe; the planning and application of high-efficiency production techniques; and the recruitment and training of an entirely new labour force. Alongside the development of the plant itself, new roads, new railsway and dock installations, housing estates and the provision of power, gas and water on a huge scale have had to be provided. The plant has been designed to produce 150,000 units a year and eventually a total of 5,000 people will be engaged on Imo production at Linwood. 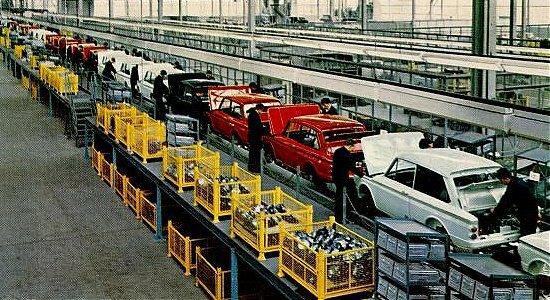 Linwood Car Factory of Rootes (Scotland) Ltd.